President Borut Pahor of Slovenia addresses the general debate of the General Assembly’s seventy-first session. The President of Slovenia said today that the world is witnessing a digital transformation and there is no doubt that soon, that change will substantially affect every aspect of social life, at the local, regional, and international levels. “I was startled by the announcement of the US Department of Labor that 65 per cent of today’s students will be employed in jobs that do not exist at the present,” President Borut Pahor told the UN General Assembly during its annual general debate, adding that the information revolution has paved the way toward global awareness of social inequalities. The globalization of the digital transformation is occurring so swiftly that it will have to be actively addressed by the United Nations, he said. In order to cope with social and technological challenges, it is necessary to start with the education of youth, he insisted. In this regard, Slovenia has become a model nation, a world-leading example in paving the way for open education on a national scale. In September 2017 Slovenia will organize the 2nd World Congress on Open Educational Resources in Ljubljana, he said. Turning to the ongoing conflicts and their potential spill-over effects, he said that Slovenia has demonstrated its readiness to actively participate in the endeavours of the international community to neutralise the causes and consequences of the security challenges undermining international peace and security. “In any and all contexts, what is absolutely essential is the peaceful resolution of conflicts. With regard to this fundamental reason of its existence, it seems that the United Nations is not effective enough,” he said. Who takes the lead of the United Nations in the future is therefore of crucial importance, he said, noting that Slovenia has presented Danilo Türk, former Head of State and former UN Assistant-Secretary-General for Political Affairs, to the United Nations as a candidate for the next Secretary-General. “I am firmly convinced that he is a strong and credible candidate and that it is time that a new Secretary-General came from the Eastern European Group,” he said. Slovenia is also continuing its efforts to have 20 May proclaimed as ‘World Bee Day.’ It expects to present a resolution during the 72nd session of the General Assembly, as it believes that strengthening common care for bees and other pollinators is needed to ensure food security, biodiversity and sustainable development, he said. Mr. Pahor is among the many leaders who will address the general debate of 71st General Assembly. 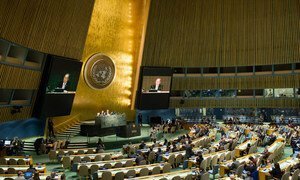 The Assembly's high-level segment opened this year with the adoption of the New York Declaration as the outcome of yesterday's first-ever UN Summit for Refugees and Migrants. Made up of all the 193 Member States of the United Nations, the Assembly provides a forum for multilateral discussion of international issues covered by the UN Charter. Continuing a series of ‘firsts’ regarding the selection of the next United Nations Secretary-General, candidates for the world’s top diplomatic post will this evening participate in a globally televised and webcast event in the UN General Assembly Hall, where they will take questions from diplomats and the public at large.